Deo Tibba Base Camp Trek is one of the easiest treks of the Himalayas. This trek comes in easy grade because you get ample opportunity to relax every day after a tiring climb/ ascend. You will come across picturesque landscapes of Meadows, Snow-Clad Mountains, Moraines and Alpine Tree Forests. The visit to Chandrataal Lake is the main attraction of this trek as you view this lake in the laps of Deo Tibba Peak. Thus, making this trek a memorable experience to cherish for a lifetime. Meet at Rambaugh Circle, Manali at 8 am. We will head to AD Hydro Project Tunnel Point where we will begin our trek to Chikka, our first campsite. The trek is about 3 kms (approx.) but the journey is stunningly beautiful as you will come across various Meadows and Alpine Tree Forest. We will fill our stomach with Packed Lunch on our way to Chikka Campsite. Our Second Day will be a gradual one as we will ascend the Valley and proceed our way to Dudu, which will be our campsite for the day. 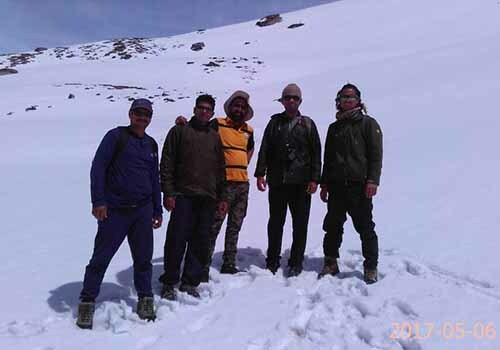 The duration of trek will be around 3 – 4 hours. 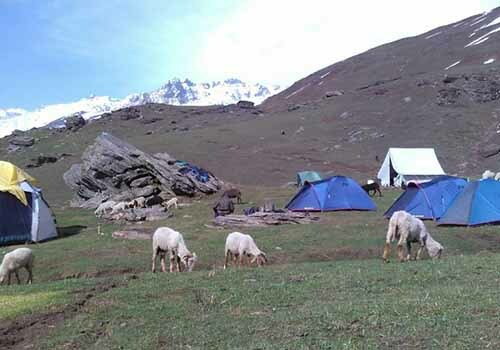 The campsite will offer you mesmerizing view of the Mighty Himalayas. Ascend your way to Seri which will be our next campsite where you can cherish the view of Waterfall, various Boulders and Panaromic of Jagatsukh Peak. The trek is of around 4 kms which will take around 3 hours. Fourth Day of trek will be of passing across moraine, reaching the Chandrataal Lake and coming back. Enjoy the view of Chandrataal lake, which is in the laps of the Mighty Himalayas. One can view the Deo Tibba Peak clearly from this point as it is the Base of Deo Tibba Peak. This is also the birth place of the river Dhugan. After spending some time at the lake, clicking various Photos head back to Seri. Today will be a fun day. We will head back to Chika and after reaching Chikka we will party along with our trekkers. Fun Games like Antakshari, Dumb Charades, Mis – Match and/ or Traffic jam will be played around Bonfire with delicious dinner to fill your stomach. As it is our last day of the trek, we will descend our way back to AD Power Project Tunnel Point. Once reaching this tunnel, we will be heading back to Manali via Jagatsukh in our transfer vehicle. Don’t forget to share your feedback while travelling back about this event. Once you reach Manali, All the Best for your further Journey and thank you for giving us an opportunity to serve you a memorable experience. ● Transportation from Manali to Manali, Transport is being provided in small vehicles or MUV’s to ensure safe ride.